Facts and history about the life and lifestyles of Native American Indians. Native Indian Canoes were the primary method of transportation by many tribes of North America who relied on them for hunting, fishing and trading expeditions. Three main types of canoes were built, dugout, birch bark and tule (reed) canoes, and their designs were based on the natural resources available in the different regions. The Northeast woodlands, and the tribes of eastern Canada built canoes made from the bark of trees (the birch bark canoe). 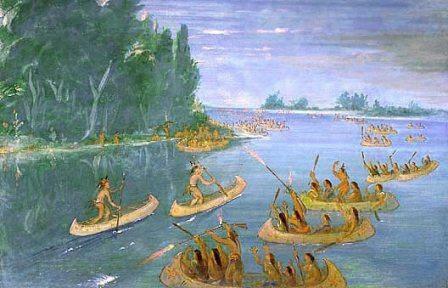 Tribes in the Northwest Pacific Coast, California and the Plateau regions built dugout canoes. Some Californian tribes built canoes made from reeds (the tule canoe).